Pictured from left to right: Mike Saxton of Orange EV; Paul Abram of the Chautauqua County Department of Public Facilities; Bryan Davis of Orange EV; Kelly Rhinehart and Steve Rexford of the Chautauqua County Department of Public Facilities Division of Solid Waste; and Bob Reuther of White Oak Power. 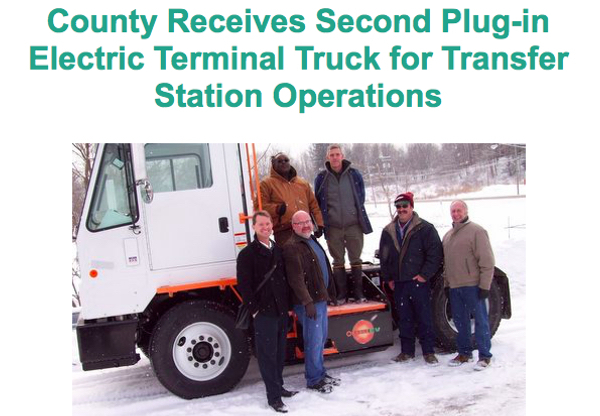 “The Chautauqua County Department of Public Facilities Division of Solid Waste received its second plug-in electric terminal truck on February 6, 2018. The first truck was received in November 2017 at the North County Transfer Station and this second truck will be used at the South County Transfer Station on 2570 South Work St. in Falconer. The truck is provided by Orange EV, a Kansas City, Mo.-based industry that builds, sells and services industrial electric vehicles. The terminal truck, also known as yard jockey, will be used to shuttle loaded and empty transfer trailers in and out of the compaction area at the South County Transfer Station. This pure-electric terminal truck will replace a diesel-powered unit that is more than 15 years old and will completely eliminate the previous truck’s diesel fuel consumption and emissions. It is also much smoother, quieter and cleaner than a diesel truck and will create a better, healthier work environment for employees; lower energy costs; and reduce the county’s carbon footprint.